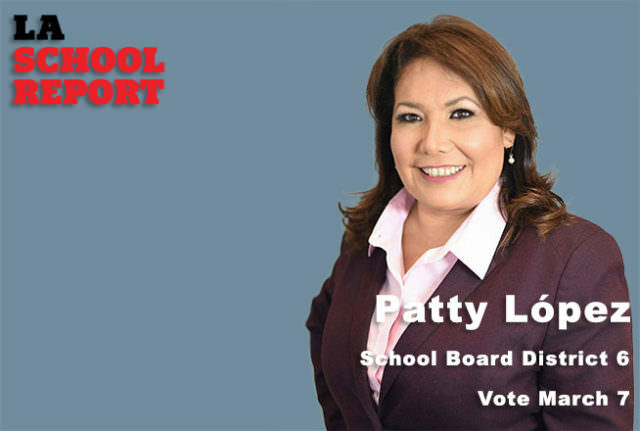 Children in LAUSD: She has four children who attended LAUSD schools and four grandchildren. Her first three children graduated from San Fernando High School, Vaughn Next Century Learning Center and Cesar E. Chavez High School. Her fourth child is in middle school. LAUSD education: López attended LAUSD schools when she arrived from Mexico at age 12. She received her high school diploma from North Valley Occupational Center through adult education. Platform: Increase parent engagement, quality education for all students, programs for students with special needs and create new programs for pre-K and adult education. Campaign funding: As of Feb. 23, LA City Ethics Commission filings show that López has neither raised nor spent any campaign funds. The California Charter Schools Association Advocates’ independent expenditure committee has reported spending $64,698 on mailers opposing López’s candidacy. López is seeking to represent Board District 6 in the east San Fernando Valley, now represented by Mónica Ratliff, who is leaving the board after one term to run for Los Angeles City Council. Her opponents in the March 7 primary are community organizer Imelda Padilla, teacher Kelly Fitzpatrick-Gonez, loan officer Araz Parseghian, Gwendolyn Posey and Jose Sandoval. She feels proud of having sponsored several education bills during her time at the state Assembly, on child development programs, diploma alternatives and language options, and adult education grants, though all failed to pass. She feels confident that this time she can make improvements on these issues as part of LA Unified. López said her priorities will be to bring more funding to the district, particularly for children with special needs, while watching over accountability and increasing parental involvement. López was born in Michoacán, Mexico. She moved to the U.S. at age 12. Before she was elected to the California State Assembly in 2014, she worked on an assembly line in Valencia with her husband, whom she married at age 18. She noted that what she has achieved in politics has been thanks to the support of people in her community, as well as family and friends, and not because she has received large contributions to her campaigns. This time is no different. “I don’t have big monetary contributions or political endorsements. I prefer to have the freedom to make better choices for my people, and not because I owe it to a campaign contributor,” she said. According to the Los Angeles City Ethics Commission, as of Jan. 11, López had reported no contributions or expenditures or received any official endorsements. One of the biggest challenges the board will face is a projected deficit of $1.46 billion in 2018-19. López believes she’s ready to deal with that and already has a plan in mind in case of possible cuts. She thinks there are too many unnecessary positions in the district’s offices that should be cut first, but not those that directly affect students. López said she has collaborated with the district for 25 years as a parent and as a community representative, so she understands how the district works. She said she would work with principals to explore options to reduce the budget and with colleges to make sure they can support efforts to provide more classes on local school campuses. She said there are excellent charter schools in her district, but she doesn’t believe that all charters are good and all district schools are bad. For undocumented students in Los Angeles schools, many of whom are concentrated in District 6, López said, “I will fight to abolish the notion that we need to categorize our students into buckets based on their migratory status. We have young men and women, they are all students period, and our job as board members is to advocate and create the best possible environment for their success. My job is to see every individual student as the next possible leader, judge, medical doctor or successful business person and to support their dreams.